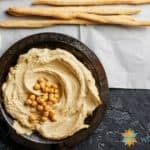 This Sesame-Free Hummus is one of our all-time favorite recipes. Loaded with healthy ingredients and savory spices, you'll love the flavor! Put all ingredients in a heavy duty blender (aka Vitamix) and/ or food processor. Blend until of desired consistency. A typical food processor will need approximately 4 minutes to get it really smooth. My Viking Processor takes about 1-2 minutes. Oh, do I love my food processor. Serve with chips, vegetables, Focaccia Flax Bread, or even "Gotta Have the Recipe" Seasoned Popcorn. Use your imagination!